Racism and dehumanization have always been a part of our culture, but in modern times, they have become universally known intolerable forms of hate speech and oppression. Not so during the Second World War. Images of people of colour were not always sensitive, kind, or even accurate. Depictions equating black people to animals, who were of lower intelligence or class were commonplace. As well, the ideas of cannibals and cannibalism are often attributed to people of colour. It not only appears in popular media of the time but in the Canadian Whites, and specifically, WOW Comics #14. The idea of the African cannibal gives less than subtle credence to the idea of seeing black people as animals, which is incredibly offensive. It allows racial hierarchies to be put into place and easily accepted. These common comic tropes of racism, fear of the other, and cannibalism are seen in this single panel comic, appearing in WOW Comics #14. Canadian comics were a brand-new industry in the time of the second world war. Previously, comic books had been imported from the United States, and they were full of action heroes, detectives, and super-human men. However, the origin of comics in Canada can be attributed to both need and creativity. The begin of Canadian comics began with political cartoons, from the time of national confederation in the mid-to-late nineteenth century (Gray). This meant that there were lots of talented and clever artists and writers ready to take of the task of writing long-form comics when the Canadian Government passed the War Exchange Conservation Act This meant that there was a vacuum in the market, and publishers such as Toronto’s Bell Features publishing house were quick to fill that void. Bell Features had originally been called Commercial Signs of Canada. The were the Toronto based publishers who were responsible for producing WOW Comics. The began publishing their comics in 1941 at the height of the war. It continued to publish comics until 1953, leaving a legacy of excellence in Canadian comics. But, what defines excellence truly, to a modern eye? Many of the artists and writers who wrote for Bell Features, as well as other publishing houses went on to have long and prolific careers outside of Canada – some even won awards for their artwork, as well as their contributions to the artform. Yet even this institution wasn’t immune from the pervasive racism of its time. The primary consumer of the WOW Comics franchise, and other Canadian White comic books were Canadian children. However, many of the comic books ended up overseas as light-hearted, heroic reads for the men fighting in the combat units. Soldiers and children were two of the most important groups to be targeting as they were both the two groups of people most interested in purchasing and reading comics, but also because they were ripe for indoctrination and propaganda. Many of the comic books, including WOW Comics #14, contained many stereotypes and tropes that are not just highly offensive for the time period, but would not even pass any measure of ethical standards today. Even on the off-chance that an editor let through a negative representation of a particular race or culture, it would be lambasted by the public. This modern ire toward stereotypes can be seen in Ashton Kutcher’s unfavourable performance as a man of South Indian descant in an international commercial for the brand Pop Chips (Elliott). The public used the social media sites Facebook and Twitter in order to let the advertising agency, Kutcher, and the brand he was representing know that it was very offensive. However, in the Second World War, there was no social media, and no public face for the outrage felt by anyone who was affected by stereotypes, emotionally or otherwise. In fact, the public face of people of colour was often the face presented by white illustrators to white audiences – black people would not be asked how they felt about these representations in comic book or other media. The insignia of the 761st Tank Battalion, a.k.a. The Black Panthers. 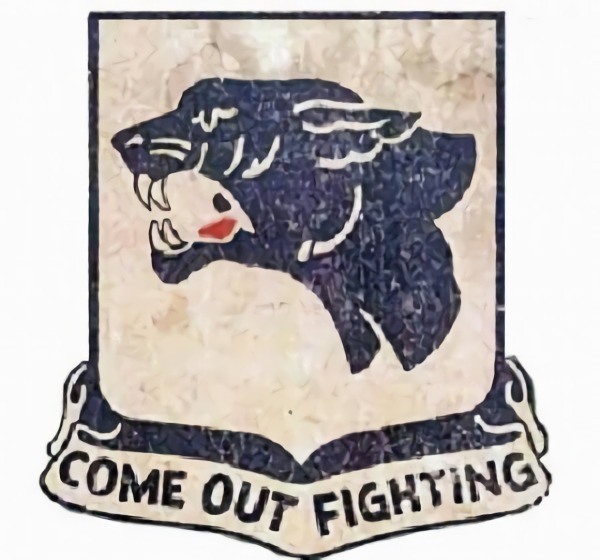 Worn as a patch on the sleeve of their uniform. Black people and those of African descent were not considered to be equal to Caucasians during World War II. It was not as if there were no heroes to be found in the black community, fighting the Nazis. One only needed to look to the American 761st Tank Battalion, under General George Patton. Fighting through the Battle of the Bulge, they were declared to be one of the greatest and most effective tank battalions in all of the Second World War (Heusinkveld). In Canada, there also people of colour serving in the armed forces. Unlike the American soldiers, black men and women were not segregated in their own units, combat or otherwise (although, this as not the case in the First World War). The Royal Canadian Navy and the Royal Canadian Air Force were not as inclusive as the army, but that did not take away from the brave men of colour serving their country in the European theatre (Veterans Affairs Canada). In the United States, movie-goers could see newsreels of the Black American soldiers and their bravery of deeds on the battlefield. These were shown despite continued segregation throughout most of American, especially in the southern states (Stricklin). 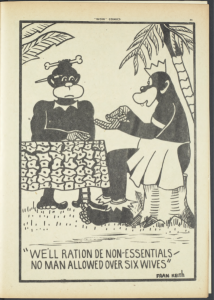 However, none of these sacrificial and patriotic acts seemed to change the racist views of black men, as depicted in the single-panel cartoon within WOW Comics #14. Within this comic, the single panel cartoon is on page 45. It depicts two African men as monkeys, possibly even as jungle cannibals, and has them saying sexist things to each other- all while trying to make a joke about, what? 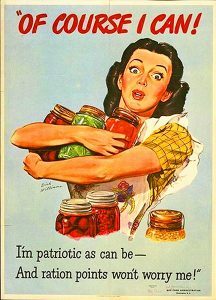 The war effort to conserve resources? The disposable nature of women? The idiocy and primitive nature of people of colour? All of these seem to be up for debate, and it behooves the consumer to look closer into the time period in which this comic was released, in order to get a glimpse at what the readers might be thinking. This single-panel comic is black and white only, with no coloured ink used inside, like most all of the other Canadian White comic books. There is a border round the entire comic, which eliminates the bleed of the picture of text to the edges of the page. While there is text, there is no narration box. The words simply hang below the picture, but above the edge of the bottom border. However, we understand this to the be one character speaking to another, and not just a descriptive caption for the picture. The artist has drawn a long shot of two figures, sitting at a table amongst the palm tree, speaking to one another. Yet, the most distinctive thing about the comic are the figures, and the visual metaphors they represent- black men, African men, are portrayed as monkeys. They have the ability to speak, participate in the war effort to conserve resources, and pass judgement on the value of women- yet they are depicted as apes. It is clearly a caricature, along with a message that during war, conservation is necessary- look! Even the apes of Africa are conserving their resources, even if they’re going about it in a misogynistic way. But, the message it sends in a negative and racist one. These ideas of black men as apes and women as disposable and interchangeable were being passed to those who read the Canadian Whites and WOW Comics. It allowed for a miasma of other-ness and dehumanization to pervade the psyche through the humour of the comic, letting racist ideals become more normalized to the readers. This readership was made up of mostly children, but also the soldiers overseas who were fighting the enemy. Very often, those who were the most dehumanized were men of those cultures and countries who made up the Axis of Power – those who sided with Germany in the Second World War. But, we see here not depictions of enemies, but two figures to seem to be aware of the war, and affected by the way, but who are not participating in any active role. The imagery of the black man as a monkey goes back hundreds of years, throughout literature. Before Darwin’s Origin of the Species, it was theorized that black women and men were closer to being apes or monkeys than white women and men. In fact, it was widely believed that there was a hierarchy in nature, and that white women and men were above black women and men, and below them were primates. As well, black people were often characterized as monkeys as a way to justify their being used as slaves and forced, hard labour in the American colonies, and later, in the states. (Blakewell). With Darwin’s publication of his evolutionary opus, it didn’t do much to dissuade bigots that black people were just as human as whites. With Darwin’s hypothesis that human beings derived and evolved from apes, the idea was that we must have come from Africa, where there are more monkeys and apes than everywhere else- therefore, the people who are still in Africa, black people and people of colour, must be more closely aligned with these human ancestors. Black people must be more monkey than white people (Alese). All of this is erroneous and incredibly offensive. These dehumanizing and visceral images play on a number of different themes, including that of danger. And, it has been proven through sociological studies that the portrayal of black people as monkeys has a serious impact on the way that non-black people think about African and Canadian Americans (Staples). The main takeaway is that white people see black people as less human, less intelligent, and less deserving of the same rights and freedoms when black people are continuously pictured as sub-human primates. In the comic, we also see the one of two figures wearing a bone through their hair, a la Pebbles Flinstone. This imagery alludes to the idea of jungle cannibalism and ferocious, dangerous jungle tribes. As recently discovered in India (Bengali), many people all over the world still believe, to this day, that people from Africa are cannibals. The drawing depicting the figure on the left wearing a bone in their hair does nothing to dispel this myth, not to the readers of WOW Comics seventy years ago, nor to the recreational reader today. Also called anthropophagy, cannibalism has been found in most cultures, on all continents. It does not have a specific African connection. Yet, people, colonizers specifically use the fear of cannibalism to once more dehumanize and alienate people of colour (Rice). While this single-panel comic is completely inexcusable, there is something to be said for making light of a terrible situation like war and rationing. Is this the right way to go about it? Absolutely not. But, as we can hear from this 1942 CBC Radio spot about rationing, it was a hard road as the government rationed more and more of the best things in life, like butter, coffee, sugar, and tea. Maybe, by laughing at the idea that these figures needed to ration the women of their community, the same way that one’s mother needed to ration butter, it took the anxiety and the pinch out of wartime for just a moment. While this single-panel comic in WOW Comics #14 is shocking and startling today, in the past, it was a commonplace trope to make fun of those who did not have as much power or status in society. 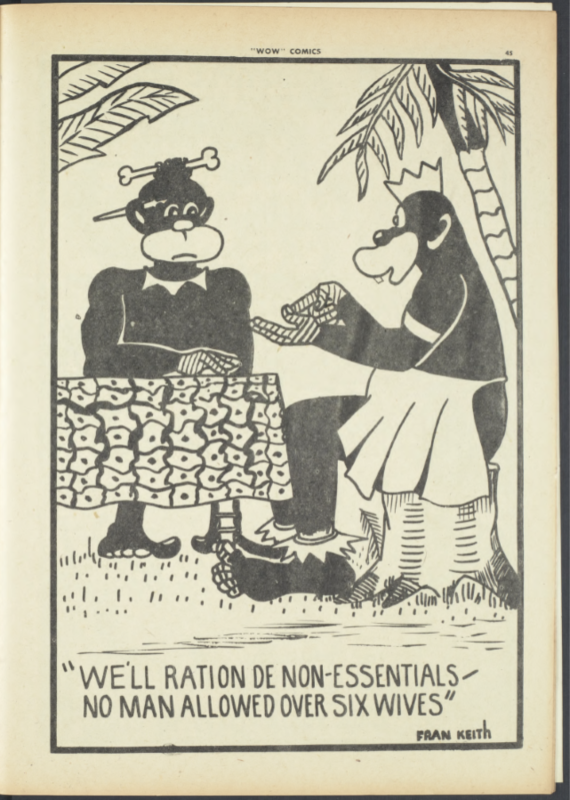 The imagery of black people as monkeys, and using cannibalism to dehumanize them even further, is something that the modern era does not see very often. Yet, it is not so far removed from our history that we do not need to be vigilant and keep the Canadian comic book industry accountable for the myths they perpetuated. Gaze, Rupert. “Uncovering the Hidden Histories: Black and Asian People in the Two World Wars.” Teaching History, no. 120, 2005, pp. 46-51. Stricklin, Krystle. Propaganda Portraits and the Easing of American Anxieties through WRA Films, The Florida State University, Ann Arbor, 2014. Elliott, Stuart. “Popchips Pulls Ashton Kutcher Ad Over Charges of Racism.” The New York Times, The New York Times, 3 May 2012.
Pepper, Laura. “Food Facts And Food Fashions”. CBC Radio, January 1st, 1943.